Understanding the accumulation of senescent cells in aging. Understanding the aging process has become a major challenge as the world´s population continues to grow older. Aging is characterized by an inevitable decline of health, an increase predisposition to chronic diseases, and ultimately death. A key hallmark of aging is the accumulation of senescent cells, which are damaged cells that have lost the ability to divide. While triggering senescence may initially be beneficial, since senescence prevents the propagation of damaged cells, the progressive accumulation of senescent cells contributes to aging and age-related pathologies. The objective of this project is to establish which mechanisms underlie the accumulation of senescent cells in aged organisms. Our hypothesis is that this accumulation is due to a defect in the clearance of senescent cells by the immune system. We will use established systems to study senescent cell elimination in vivo and in vitro, and determine the relative contribution of the immune system and senescent cells to this accumulation. Results from these studies will provide a translational and mechanistic framework for better understanding aging, and generate strategies to modulate senescent cell clearance with anti-aging purposes that could be translated into other settings, such as liver fibrosis and cancer prevention. Cellular senescence is a stable form of cell cycle arrest that limits proliferation of damaged cells and can be triggered in many cell types in response to diverse forms of cellular stress. Cellular senescence imposes a potent barrier to tumorigenesis, contributing to the cessation of growth of pre-malignant or benign neoplasms, to their progression to a malignant phenotype, and to the cytotoxicity of certain anticancer agents. These anti-tumor effects are mediated through cell autonomous or non-cell autonomous mechanisms. These works also indicate that, although effective, the senescence program can fail, if the program is inefficiently induced (senescence bypass) or if the senescent cells re-enter the cell cycle (senescence escape). Even if senescence bypass is well established, little is known about the molecular mechanisms underlying senescence escape. Technical limitations have restricted the comprehensive study of the progression from a senescent pre-malignant lesion to a full-blown tumor, which requires the sequential perturbation of genes in vivo. By combining unique mouse models of cancer, RNA interference technology, and state-of-the-art expression and epigenomic profiling, we will dissect the molecular pathways involved in the maintenance of the senescence program and the impact of their loss on tumorigenesis. This work will change the scale and depth at which we understand senescence and tumorigenesis, and provide strategies to reinforce senescence for therapeutic purposes. I anticipate that this research will generate useful reagents and novel strategies to harness senescence for cancer prevention and treatment. Hepatocellular carcinoma (HCC) represents a major health prob­lem, causing more than 700,000 deaths annually worldwide. Although treatment of HCC has greatly improved over the last decades, most HCC patients diagnosed at advanced stages are ineligible for curative ablative therapies such as liver resection or transplantation. The multikinase inhibitor sorafenib was recently approved as the first systemic treatment for patients with advanced HCC, suggesting that targeted therapies could be beneficial in this cancer. However, clinical experiences have revealed that in the most common types of solid tumors, including HCC, progressive lose of efficacy and intrinsic and acquired resistance against molecular therapies are inevitable, indicating that treatment with a single agent is condemned to failure. It is therefore clear that we must move away from a single-target view and toward a paradigm in which we consider entire molecular networks and target critical nodes in combination. The overarching goal of our research program is to discover and validate novel combination therapies with increased efficacy for the clinical management of HCC. Experimentally, we will take advantage of a suite of RNAi (RNA interference) tools optimized for drug target discovery and mouse models that enable in depth analysis of relevant drug targets. We have previously demonstrated that RNAi screens can be successful in discovering novel therapeutic targets for different types of cancer, including HCC. Here, we will modify the screening approach to identify genes whose inhibition cooperates with palbociclib, and establish a pipeline that can be applied to other inhibitors or other tumor types. Pipeline to uncover synthetic lethal interactions in liver cancer. 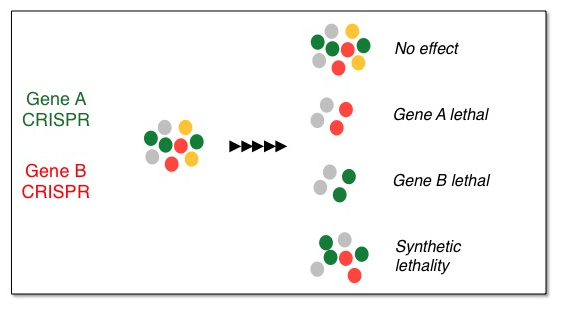 Synthetic lethality arises when a combination of mutations in two or more genes leads to cell death, whereas a mutation in only one of these genes does not, and by itself is said to be viable. A synthetic lethal approach to cancer therapy is exploited to develop therapies with reduced off-target effects, and increased selectivity. We are currently developing an assay to identify synthetic lethal interactions by using the CRISPR/Cas9 system, a novel technology to genetically target genes. By linking the CRISPRs to fluorescent reporters, we have developed an assay that identifies true synthetic lethal interactions, excluding general toxicities. With these tools in hand, we aim to uncover novel synthetic interactions that can be targeted with small molecules. Identifying novel tumor suppressor genes silenced by epigenetic mechanisms in liver cancer. It is now recognized that cancer is both a genetic and an epigenetic disease. Genetic lesions alone cannot explain the complexity of the aberrations that arise in a cancer cell. The systematic study of genomic alterations in cancer has unveiled important cancer driver genes. However, similar studies globally studying epigenetic alterations are missing. Here, we will identify and characterize new TSGs silenced by DNA methylation in HCCs and study the role of methylated regions in cancer development. Experimentally, we will take advantage of epigenomics analyses of human and murine HCCs to inform functional studies in mice, and implement a suite of new RNAi tools and animal modeling approaches to increase the cost effectiveness and pace of our analyses. These studies will identify intrinsic mechanisms of tumor suppression that limit the progression of liver cancers, perhaps suggesting better strategies to classify these diseases and pointing towards new therapeutic targets.